Hi steemians! As we announced last month, different from what we've done all this year, now in December we are pausing in the STEEM distributions for collaborators in Steem.center. At this time all editions would be welcomed but will not receive any share of STEEM collected here. In a few days, on next year, we plan to come back with the monthly transfers as usual. Happy New Year! In December, as you can check in the Steem.center Recent Changes page, even without the STEEM distributions, we have many collaborators on the wiki. Thanks to @neander-squirrel, @littleboy, @rt395, @axorve, @freyman, @littlesnow, @thomaskikansha, @gazetagaleguia and @wagnertamanaha. We also have new users registrations: @mysjm, @mrcrown, @thorpeedo, @ackhoo and 有文化流氓聚集地 (we still didn't find his/her Steemit username yet)‎. Welcome! After almost one year of the project we learned that it would be better to plan in advance, so we proposed to monthly share 60% of the rewards collected here in our wallet and keep the 40% left to the next distribution, and so on. We also noticed that most of rewards were received in Steem Dollars (SBD), so we suggest to convert it every month, using the Internal market when appropiate. But in the wallet should remain 6.000 SBD that will be used to pay the @steemvoter for premium services and its 3.000 SDB monthly fare, for the reason you see below. The voting power of the upvotes described above will not be cumulative, when necessary, the most powerful index will be applied to the benefited user. These upvotes will be configured using @steemvoter, a third party bot service, it means that @steemcenterwiki can not guarantee the routine if they discontinue or interrupt the service. What do you think? Please, feel free to comment any sugestion or criticism, just reply this post or direct edit the wiki page above with your considerations and opinion. If there isn't any flag or complaint about these rules updates, next year the project will start following it. 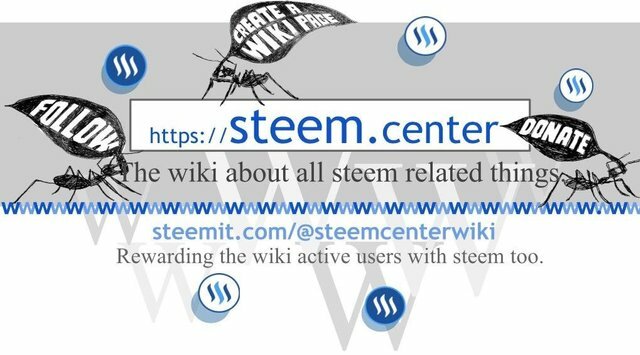 Thanks again to all participants, donators, followers and suporters, we invite you to continue collaborating and keep working to make Steem.center in the wiki about all Steem related things! If you liked our proposal just get together to create a collective knowledge platform to new steemians, advanced users and developers transforming Steem.center in the wiki of all things Steem related. You are invited to join the project. 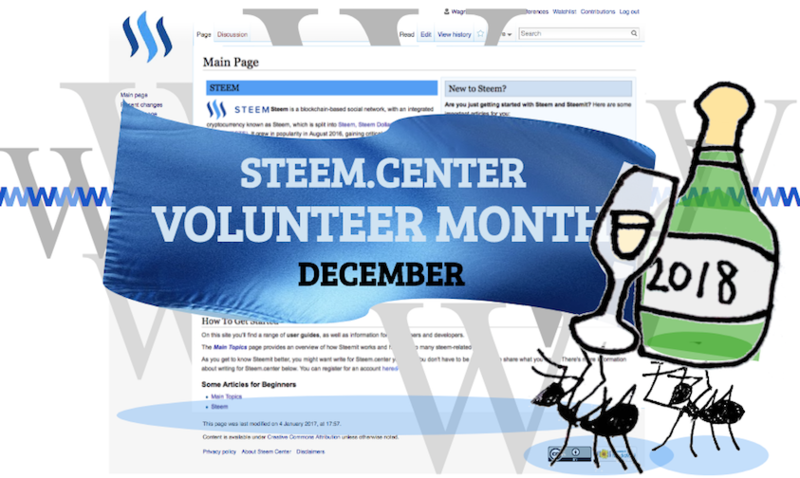 If you want to be in the first 2018 distribution list to earn a share of the STEEM collected by this account, please follow us here in @steemcenterwiki, register in Steem.center with your Steemit username. Then start the new year making wiki collaborations! You can find some suggestions to start new pages in Articles for Creation and use the sandbox page to test and play wiki editions for free. We proposed some loosely guidelines and if you need just ask for a personal response in Steemit.chat #wiki channel. You can also support the project with donations, just transfer any STEEM value or STEEM Power delegation to @steemcenterwiki. Or follow us, upvote, reply or resteem this post. Image credits: photos by Ronny K. (Pixabay) and illustrations by @wagnertamanaha. It has sense. Looking forward to the next year's collaboration! Thank you! Good luck and happy new year again!! You are welcome! Thanks, good luck and happy new year again! !